A London based band that doesn't try to sound like the Klaxons or The Libertines is welcome enough but big smoke dwelling The High Wire are a breath of fresh air. Their echoy, layered music is as unique as it is sentimental. 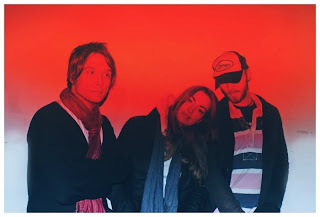 Whilst the band ooze with 80s shoegaze influences 'Leave Me In Love' is more of a twee affair, driven by seasidey synth whilst male-female vocals serve the listener a hefty portion of sentimentality. This tune sits in the same mould as The The's classic 'This is the Day': simple, airy and haunting. Whilst spare and touching songs are nothing new (indeed up and coming trendites 'Girls' offered up a similar format for their single a few months ago), The Hire Wire manage to add their own touches, layering vocals and thickening up the song enough for it to feel like it could wrap around you. Despite the daunting task, and perhaps unintentionally, this band have managed to avoid the cliches and write an honest to God love song, ready and waiting to be adopted by many a lovelorn teenager across the country. And quite right too.